Etymology: "canthus" is a Latin word which means " the wheel " or "the iron band which encircles the wheel", in allusion to the radiant form of the flower. Habitat: Calycanthus makes the best of all soils. It prefers a sunny position, sheltered from the wind. Shape: spread large. Branches are first upright then drooping. Foliage: deciduous. Opposite, simple leaves, obovate, acuminate, clear veined. They are 5 - 15 cm long on 2 - 6 cm broad. Flowers: upright, of carmine red colour. They appear in spring, after leaves. Diameter from 4 to 7 cm. Tepals unfurl a little like the magnolias and give it a shape of a spider. Fruits: capsules of 6 cm long on 2,5 cm in diameter, containing many seeds. 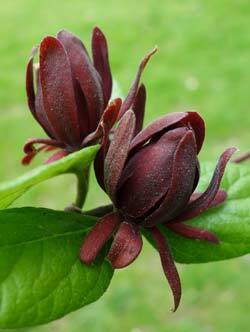 Calycanthus floridus: from the East Coast (south Mississippi Pennsylvania, Ohio, north of the Florida). Calycanthus occidentalis: West coast (California and Seattle).